As I sit here trying to detail out our Family Trip to WDW we took almost four months ago, we are bracing for a severe winter storm up in Jersey. I could think of nothing better on a snowy day that to finally get around to reviewing our trip in sunny Florida. I’ve mentioned this before in an earlier post but figured I’d just give a quick review. This trip actually started as a destination wedding for my brother-in-law’s sister. She and her fiancé (now husband) are huge Disney fans and wanted nothing more than to be married in the most magical place on earth. We decided to extend our scheduled stay for the wedding into a week-long vacation. As I’ve posted in the past there is a lot of pre-planning for a Disney vacation that goes on and makes the time before your trip almost excruciating to wait through. I won’t put you through those details this time as they haven’t changed (dining reservations, attraction fast passes, etc) but instead jump right in. 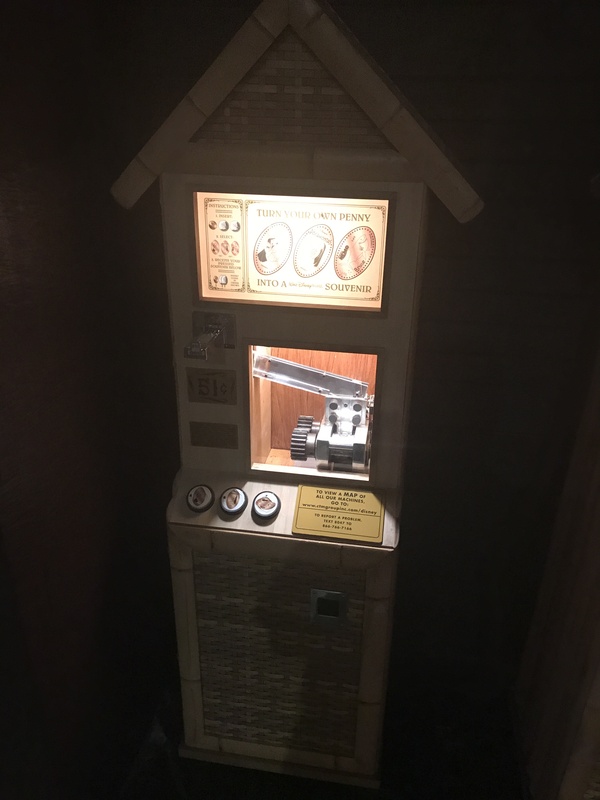 On this trip I did have scheduled to visit a lot (and I truly mean a lot ) of pressed coin machines. Although since I had visited for a week-long trip just a year previously in 2015, and a few shorter trips earlier this year there weren’t a lot of new coins I needed to collect. Instead I decided to take this opportunity to replace some of my old coins. Back when I first started really getting into collecting the coins my selection of pennies was not the best so I have a lot of very tarnished or pennies in just terrible condition. This was my chance to get these replaced and up to a higher standard. Without further ado, we pick up our story just as we disembark the airplane in Orlando. As with most air travelers as soon as we were off the plane everyone needed a quick bathroom pit stop. 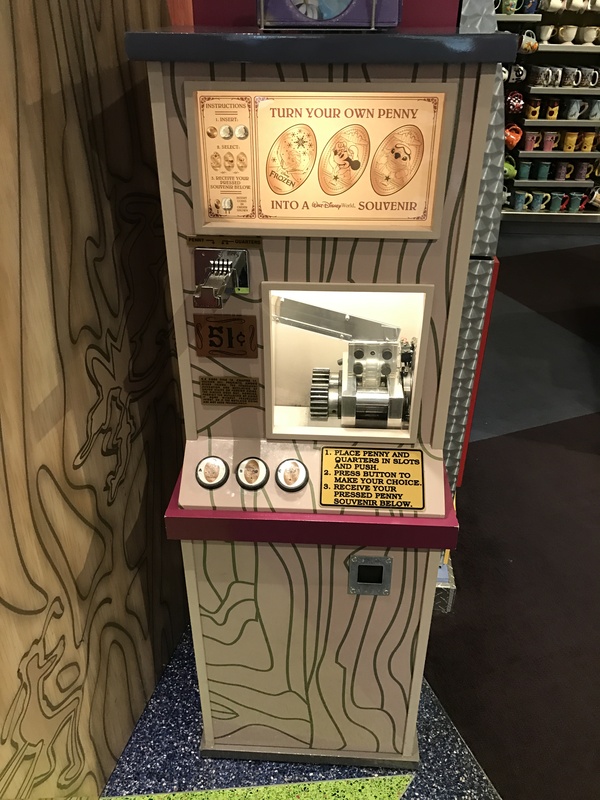 I took the opportunity to visit the Disney EarPort store again and make sure the penny machine hadn’t changed. The machine was still in the same location (near one of the exits) and had the same three designs. You can read out these coins in further detail here. Next we headed to our rental car and were off to our next destination. 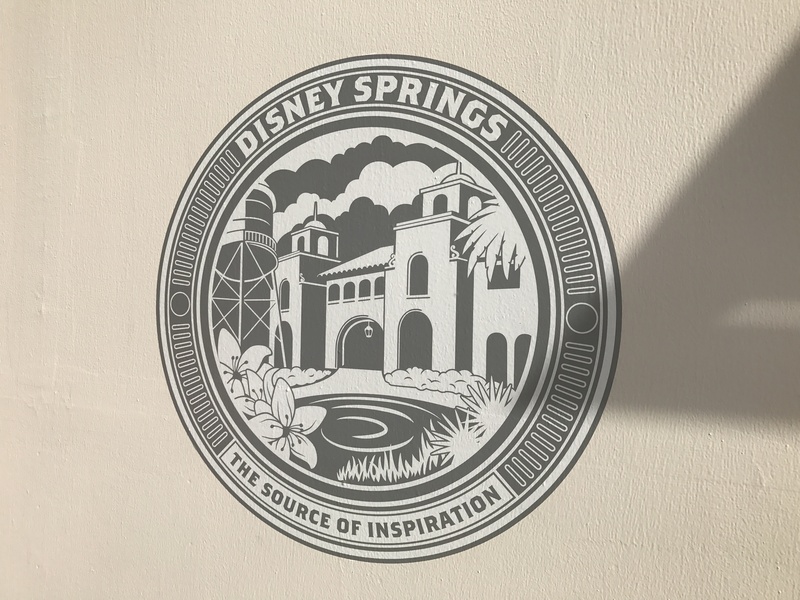 We had some time before our resort was going to be ready so we took the opportunity to check out something we have been working on for the last year or so. My family is actually in the middle of relocating to the Orlando area. As you may know from earlier posts I’m originally from Canada, moved to New Jersey in ’96 and am now heading even further south to Florida. We are having a new house built about 30 minutes from Orlando which is why we have been making numerous small trips down to Florida this year, and helped keep up with all the new pressed coins. 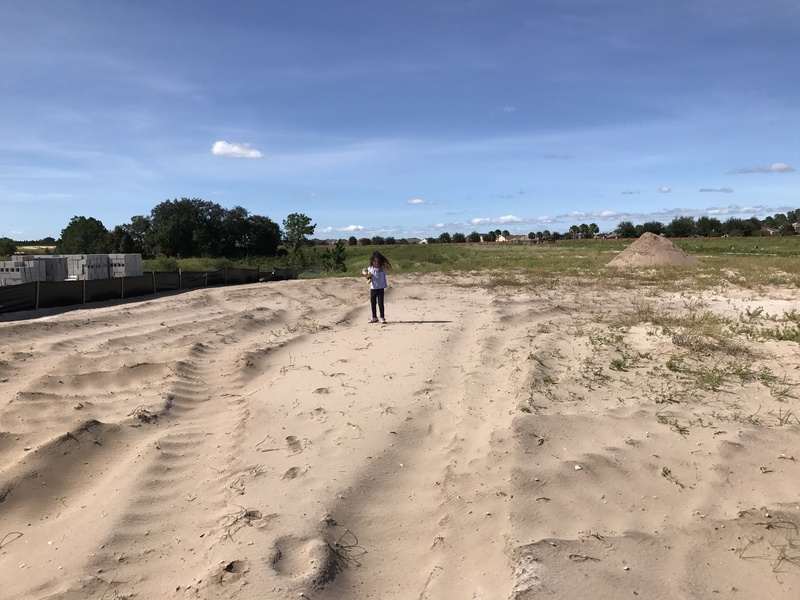 Above is a picture of our daughter Hanna on our future home site. The building should start shortly and we are very excited about the move. We stopped by just to check up on things and ensure everything was progressing which it was. This was also the first time that Hanna and our younger daughter Melody were able to see the model home we picked and we got their stamp of approval. As the day went on we were surprised to not receive our TXT message from Disney with our room assignment, so we decided to head over to Disney Springs for some shopping and dinner. For those of you that haven’t been to Disney Springs yet please go check it out. It’s definitely a busy place but I feel the added Marketplace area has helped spread the crowds out a little bit. The new Marketplace area is really nice to wander around, and see all the changes. 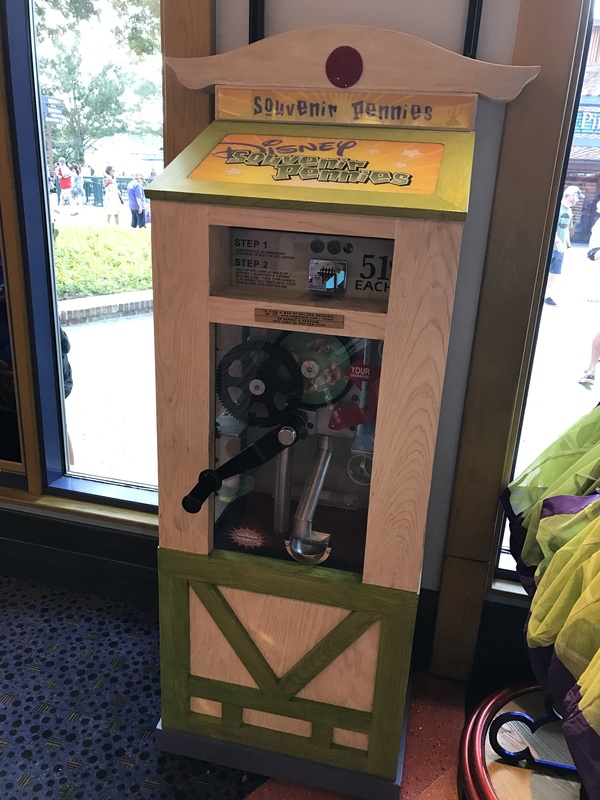 I remember years ago visiting Pleasure Island before it was changed, and they have definitely been making some great new additions. The new restaurants by the way are fantastic and make for a lot of new choices. We didn’t have any dining reservations, and just decided to wander around to kill off some more time before our room was ready. 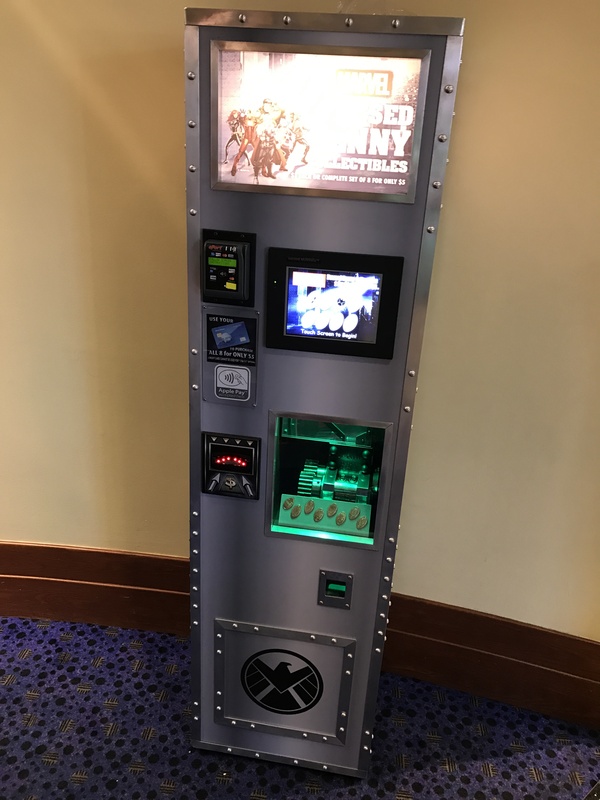 There has recently been a bunch of new pressed penny/token machines placed here and I wanted to get some updated pictures. First stop was the Marvel Superhero Headquarters. As you can see above this is one of the new 8-design touch screen machines, and you can read more about the coins I acquired previously here. Right next door is the Star Wars Galactic Outpost which is a personal favorite of mine. This is another 8-design machine that I had previously collected. Unfortunately my phone was dead on my earlier trip so this was a nice opportunity to get a picture of the machine. 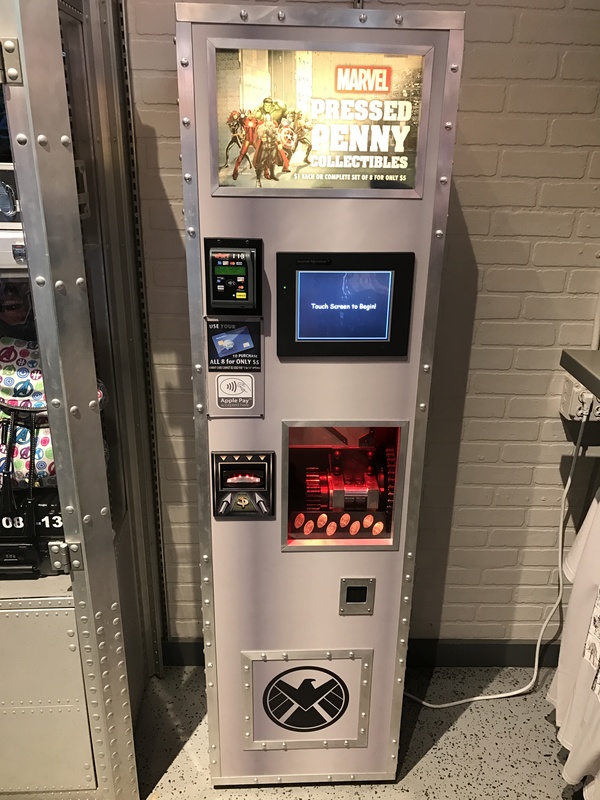 These new machines are very cool to watch in action, and you can check out these coins in more detail here. Since we were visiting during October we were able to get tickets to the Mickey’s Not So Scary Halloween party which I’ll write about in a future post. But we had to stop in at the World of Disney Super Gift Shop to find our girls costumes for the party. But before heading in there was a new food stand I wanted to try. 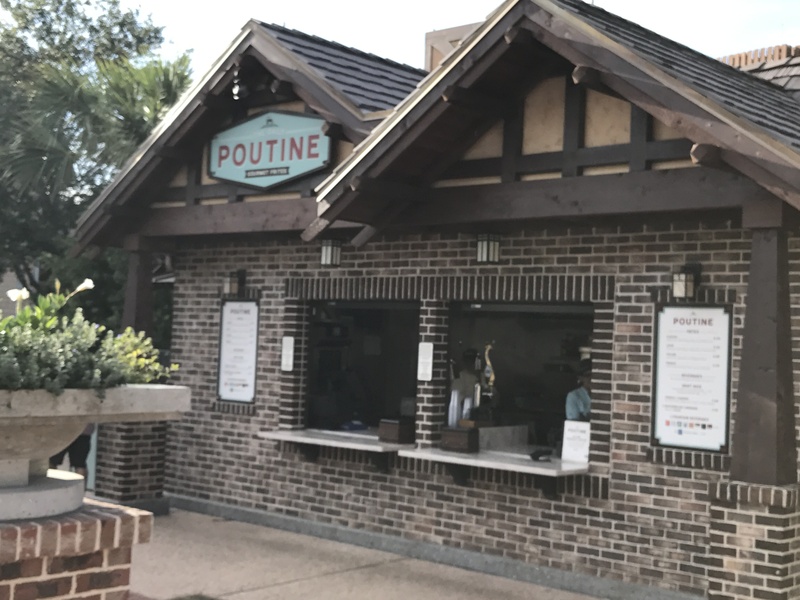 The Daily Poutine was one of the first new food spots in the Disney Springs transformation. Being from Canada I know all about Poutine and have missed it dearly in all our years in Jersey. For those of you that aren’t familiar with Poutine it is usually a pile of french fries, covered with cheese curds and a thick brown gravy. Not the most waistline friendly but helped us bulk up during a frigid Canadian winter. This new stand has quite a few different options but I went for a special they were offering just to try something different. All-Day Breakfast Poutine how could I not try this unique offering. I will admit when they first gave it to me the gravy on it looked a little unappetizing, but I dug in and it was really good. 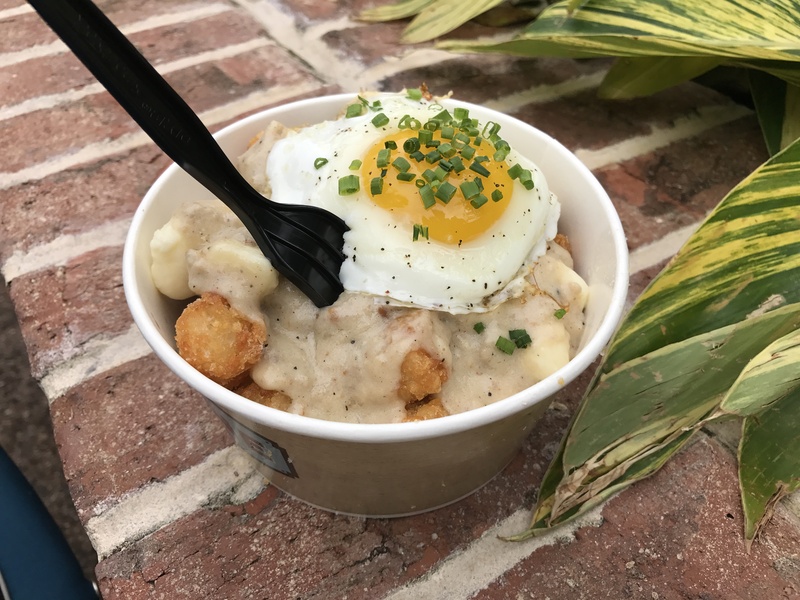 The gravy was very flavorful, and when you cut into the fried egg the runny yoke it all came together. I don’t know how often this may be available but if it’s on the menu be sure to give it a try. 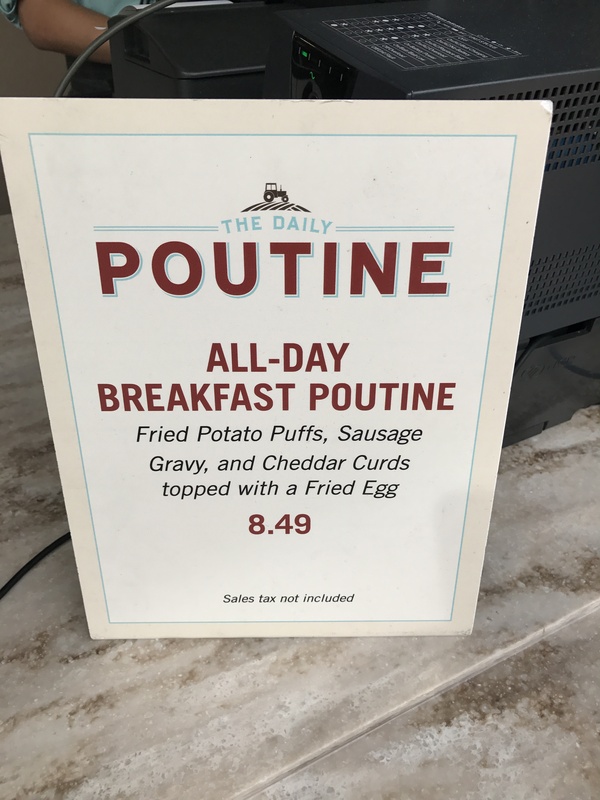 While I worked on my Poutine the rest of my family had already gone into the World of Disney looking for some souvenirs but primarily the Halloween costumes. After checking out a lot of different dresses and tiaras Hanna decided to be Aurora from Sleeping Beauty, and Melody was going to be Tinker Bell. With costumes paid for we headed a little further to the Once Upon a Toy Store which is currently the location of three machines. I wrote about them previously and you can check out the details here. There is a 4-design hand crank machine, and then two 8-design touch screen machines. Definitely a must stop to get a quick boost to your coin collection. By this time it was starting to get dark and we were in need of some food. We really wanted to try one of the new restaurants and were hoping to avoid a long wait. 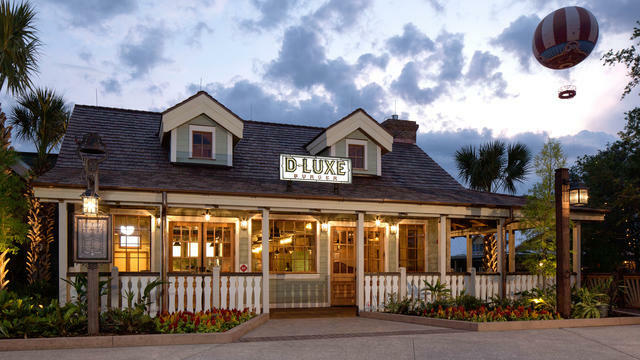 Over in the new Marketplace area we stopped in at the D-Luxe Burger which had a fairly short line (10 minutes to order) and ended up having some really great burgers. After dinner we still hadn’t heard anything from our resort but figured the room had to be ready. We headed over and were told they were having some system issues, but that our room was available. By this time most of my family was exhausted and just wanted to relax in the room for the rest of the night. I had received a phone call from my sister that her family had also made it to their resort and asked if we wanted to stop over for a visit. My daughter Hanna was immediately revived with the notion of seeing her cousin Ava. They were staying over at the Polynesian Village Resort so Hanna and I hopped in the rental car and headed over. After parking we first stopped into the grand ceremonial house (main building of the resort). 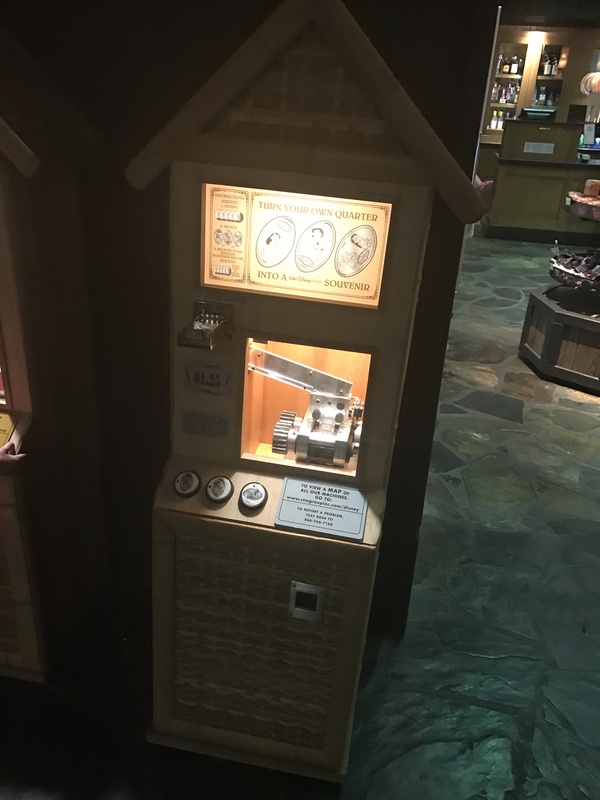 We started on the second floor over near the new Moana Mercantile there were two coin machines. 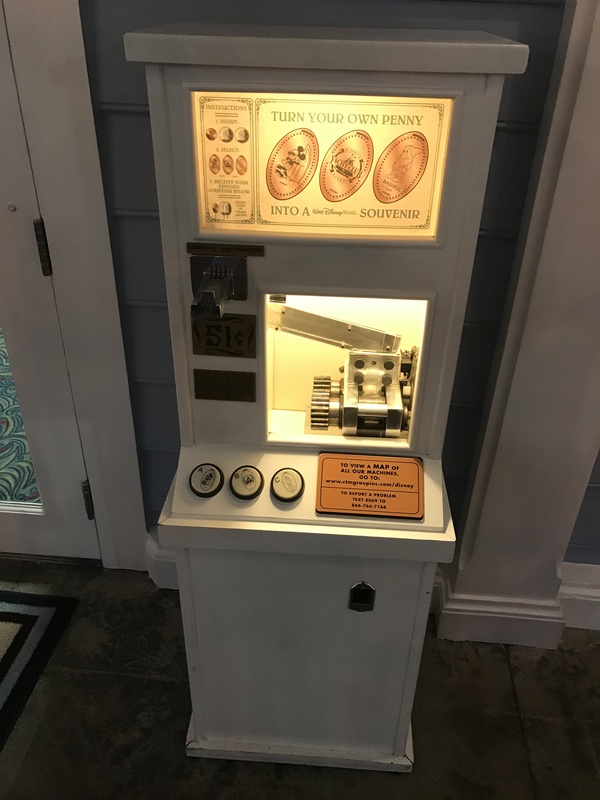 The first machine had 3 penny designs. The designs included Pocahontas & John Smith, Pocahontas kneeling, and Bruce the Shark from Finding Nemo. 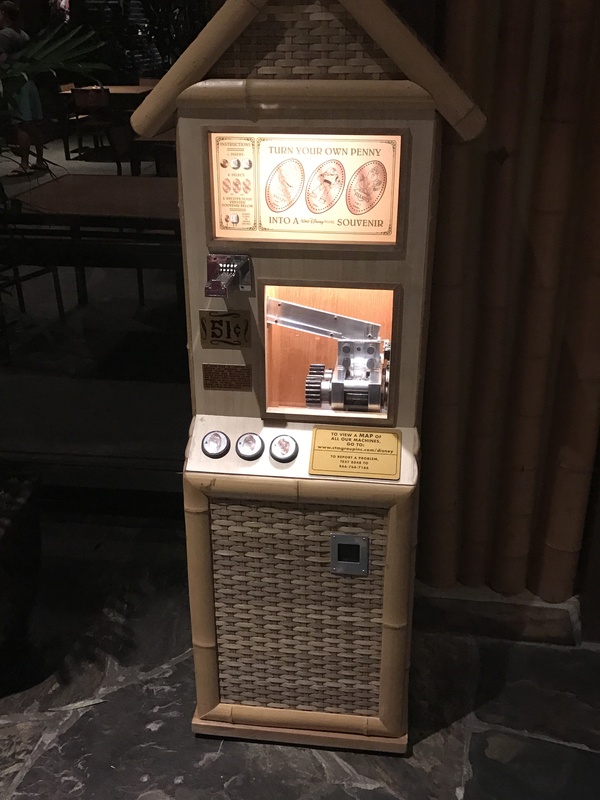 The second machine was also a 3 design model but pressed quarters. The images were of Lilo dancing, Lilo & Stitch, and Lilo & Stitch eating ice cream. These machines are right near the check in for O’Hana which is one of our favorite restaurants. 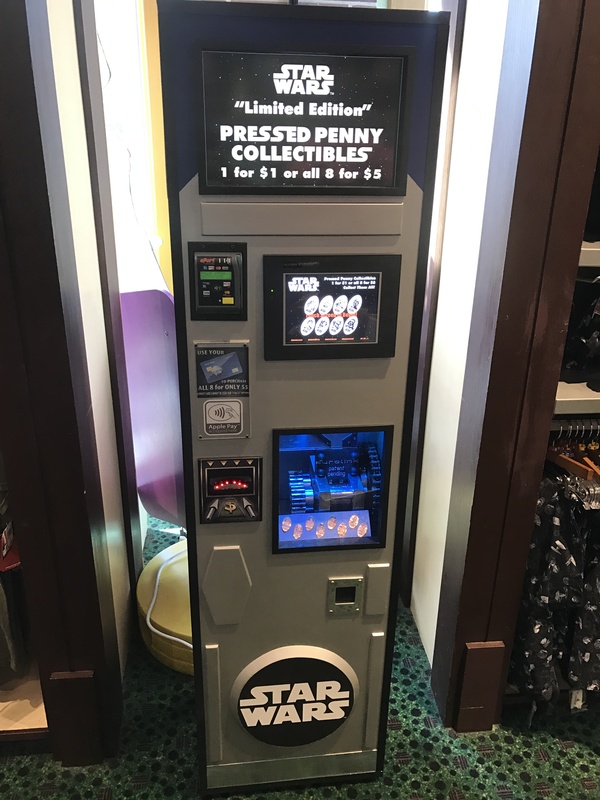 It was tempting to head over to the bar and get a Lapu Lapu (I’ll explain this later or you can google it) but there was another penny machine to find and a special treat we were looking forward to instead. We took the stairs down to the first floor and just inside the sliding doors that led out back towards the main pool was the last machine at this resort. It has 3 penny designs of Sneezy, Buzz Lightyear, and Scar from the Lion King (Disney Villains set). With the coins stored away Hanna and I walked through the sliding glass doors and made an immediately left turn. We came face to face with the Pineapple Lanai which is one of the only placed to get the famous Dole Whip outside of the theme parks. There were a few people ahead of us but we knew it was worth it. Hanna and I each got a Dole Whip and we gobbled them down. This is absolutely a must have snack if you are in Disney, it’s Pineapple non-dairy soft serve. I’ve tried to make it at home and have gotten pretty good results, but there is nothing like getting it straight from Disney. After we devoured our Dole Whips we finally made it over to my sister’s room and were able to visit with her family for about an hour. By that time the long day had start to hit the kids and they all were staggering around half asleep. We said goodnight and we headed back to our resort. 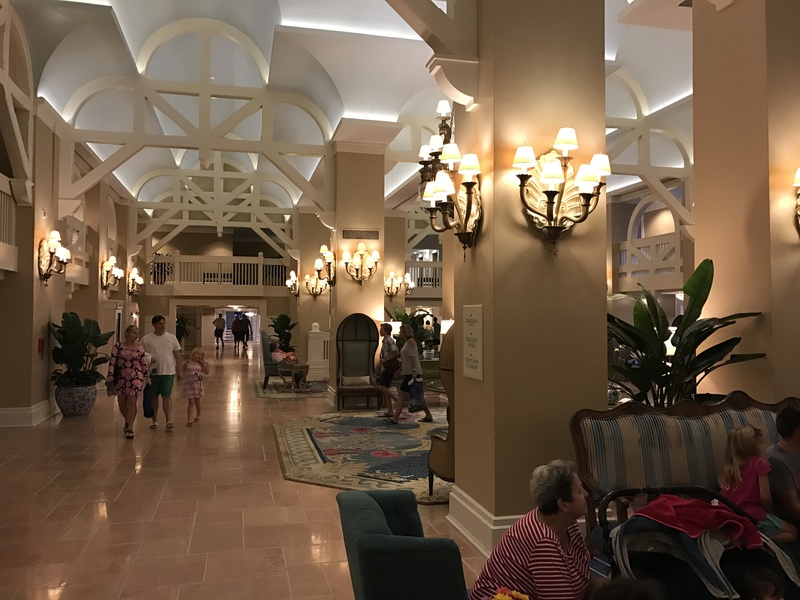 I don’t think I mentioned this but we were staying at the Beach Club Resort over near Epcot. Hanna was asleep in the stroller so I took the opportunity to try to get one last machine before we turned in. 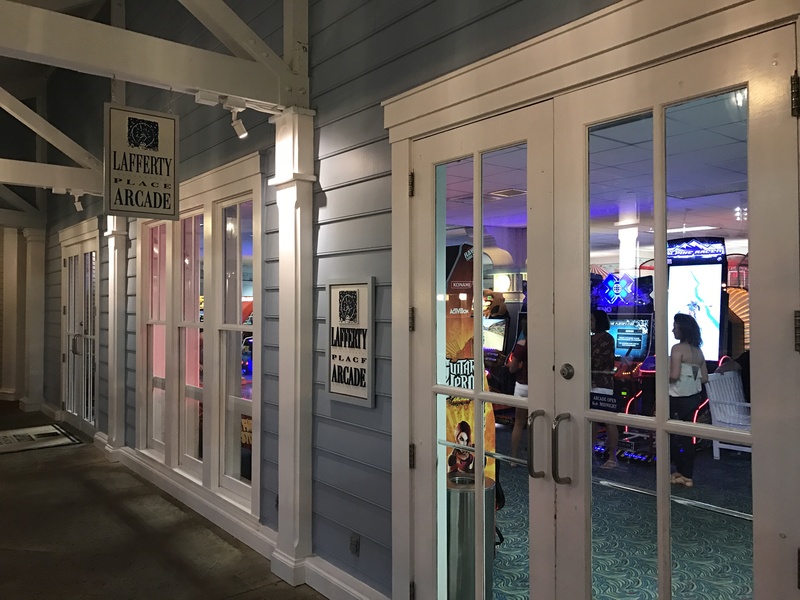 We headed out the back of our resort toward the Yacht Club resort and right beside the Beaches & Cream Soda Shop was the Lafferty Arcade. 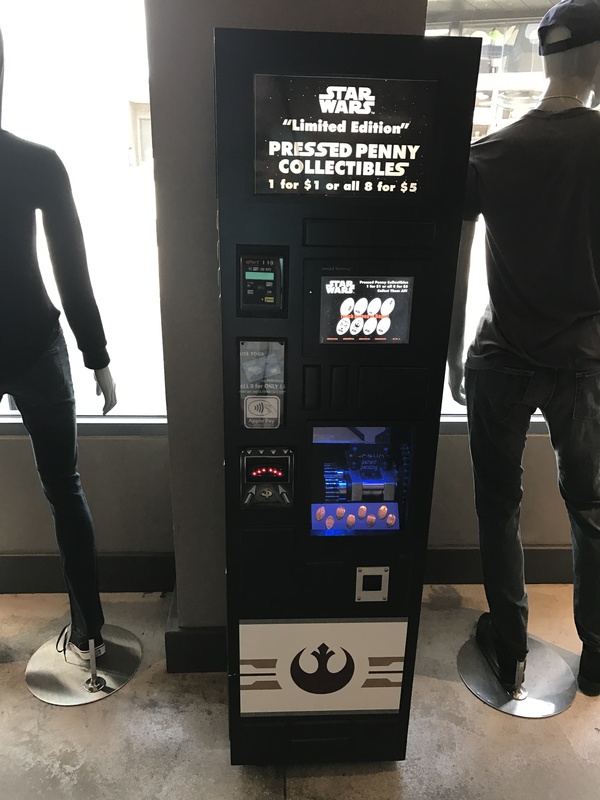 When I visited this arcade a few years ago to collect the pennies it was located inside the arcade but this time around the machine was outside. The images on these pennies are of Mickey with a Surf Board, The Yacht Club logo, and Bashful Dwarf. We had been up early and it was now getting pretty late. Hanna was completely out in the stroller so I quickly made my way back to our room. When we got inside we were greeted with a special gift from the resort staff. 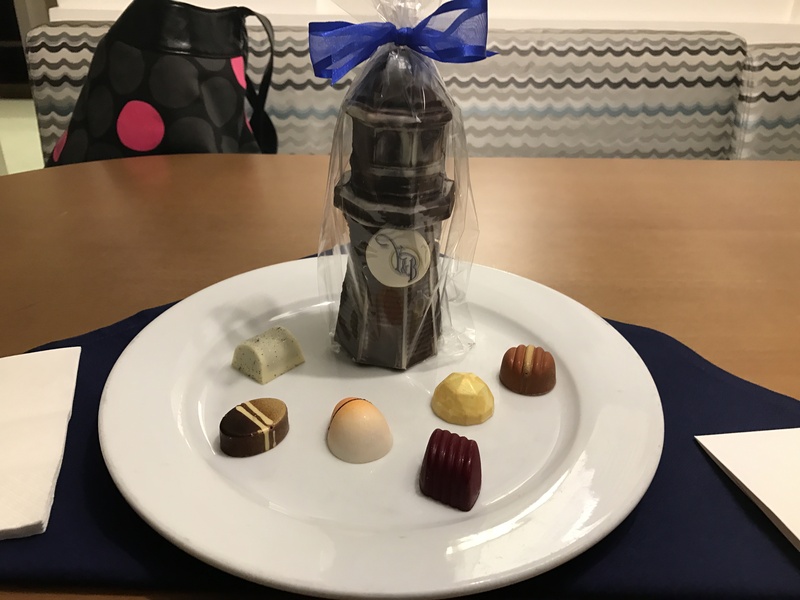 These were some amazing hand craft chocolates, and a cute chocolate lighthouse. It was late to dig in this first night, but made for an exquisite pre-breakfast snack the next morning. Day 1 was pretty busy and I was able to check off a nice batch of machines from my to-do list but there were lots more still to come.